„Mag“? „Vergöttert“ trifft es viel besser. 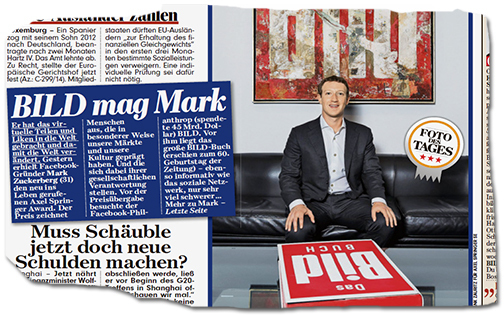 In der Welt von „Bild“ ist Zuckerberg nämlich nichts weniger als ein übermenschlicher Held, der Franz Beckenbauer des Internets. 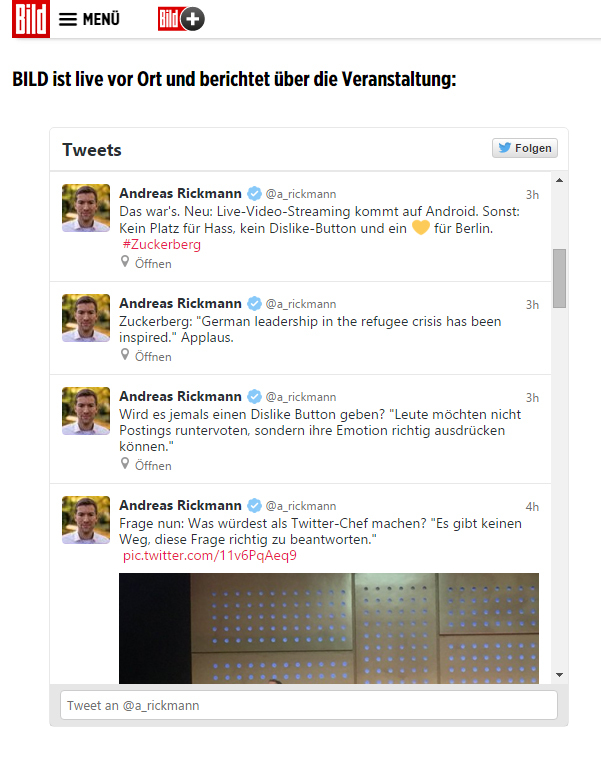 „Bild“-Oberchef Kai Diekmann nennt Zuckerberg den „Charity-Gott“. Springer-Vorstand Mathias Döpfner schwärmt, er sei „a wonderful human being“. Franz Josef Wagner nennt ihn in einem rasselnden Atemzug mit Nelson Mandela und Mutter Teresa. Umso aufgedrehter war die Springer-Bande gestern — denn der Facebook-Chef hatte angekündigt, sie am Abend in ihrem Hauptquartier zu beehren. The stage design of the #AxelSpringerAward comprises 24 #birch trees from a forest in the Berlin suburbs. … und alles ganz facebookblau-kuschelig gemacht für den man of the evening. Well, this is a tricky one. If it’s not a public photo, then someone should not be taking your photo and using it publicly. You know, in general, the rule is that you control all the content that you post on facebook. (…) If we’re building a community and people are sharing stuff that they don’t intend to be public, and then someone else is making it public, then that’s an issue. Right? And that’s gonna undermine the trust that our community has in us to making sure that, you know, when you share something with just your friends then that’s actually going to only the people that you want. This is a tricky area for us, because we don’t control … you know, the law in most countries around the world, I believe, is that you post a photo, you own that photo. And that people don’t have the ability to use that photo without your permission. So if you find out that someone, you know, whether it’s on a blog or … you know, someone else is using your photo without your permission, you should have the right to be able to send them an e-mail and get in touch with them and tell them that that they don’t have permission to do that and they should take it down. In (…) most countries I can think of, if people don’t respect your rights for the content that you own, you have legal recourse to go after that. But this is obviously an issue for facebook, because we want people to feel completely comfortable, that if they share something with their friends or with a community of a hundred people, then that’s not somehow gonna be taken and shared with more people. Unfortunately, we don’t have complete control if someone takes a screenshot or something, but you do own those photos and have the right to have it distributed only how you want, wheter that’s on our service or outside. Man darf also sagen: Er findet’s eher nicht okay. Das hatten wir ehrlich gesagt vermutet, und wir hatten die Hoffnung (zumindest ein kleines bisschen), dass — wenn es schon die Justiz, die Polizei, Angehörige von Betroffenen, der Presserat, wir und auch sonst keiner schafft, den „Bild“-Mitarbeitern die Fotoklauberei bei Facebook auszutreiben — dass vielleicht ja Mark Messias Zuckerberg etwas in seinen Jüngern auszulösen vermag. Jene Jünger waren natürlich auch bei seiner Fragestunde, haben live getickert und später einen Artikel gebracht, in dem sie die Fragen und Antworten zusammenfassen. 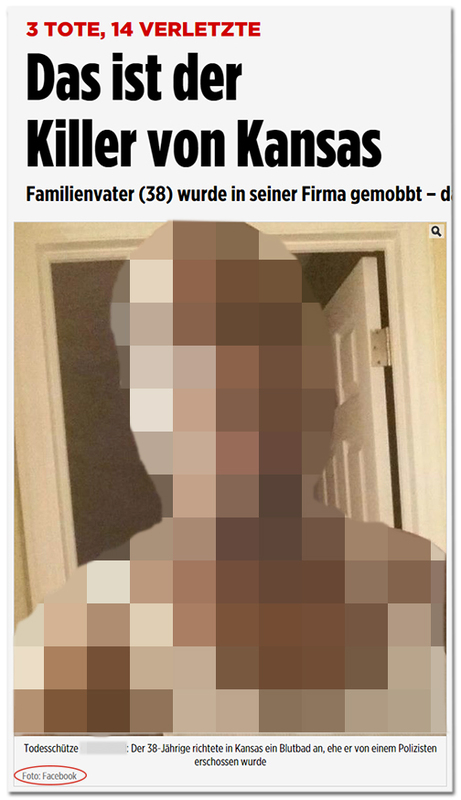 Über das Thema Täter- und Opferfotos schreiben sie sowohl im Ticker als auch im Artikel — kein Wort.